Parrot Swing is the only minidrone that lets you fly a supersonic plane with surprising ease. It's also the only plane with autopilot and a vertical take-off and landing mode. With the #Parrot Flypad controller, discover ultra-precise control to fly like a pro. Transform the sky into an amazing race track! ENJOY A BRAND NEW DUAL PILOTING MODE. 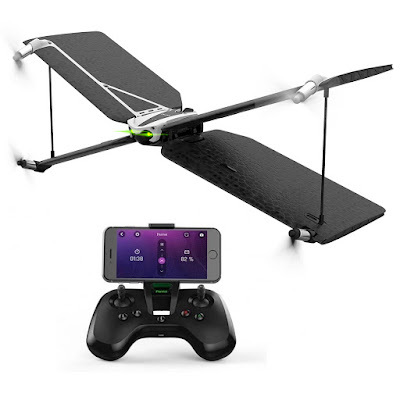 Its unique X shape provides you with two drones in one. With an advanced flight controller and reliable sensors, the Parrot Swing is the only plane minidrone with vertical take-off and landing. Sturdy and easy to grasp, nothing will stop you! GAIN SPEED. Be the fastest among your friends. To gain speed, tilt your Parrot Swing! The more you lean, the faster you go. You can also activate Boost Mode to be even harder to catch. Go for it: slalom and avoid obstacles to be the first to get there. ULTRA-PRECISE PILOTING WITH THE PARROT FLYPAD. The Parrot Flypad gives you the most precise control of your Parrot Swing drone and allows you to pilot it over a distance of up to 60 metres. With its mount that adjusts to your smartphone, check the remaining battery power and flight time on your screen or change the control settings.